Published in the Dover Express, 4 January, 1980. Richard IX, in 1396, before sailing for France, went to the Maison Dieu, and there appointed his Regent. This King embarked at Dover, rejoicing in the prospect of returning with the daughter of the King of France as his bride, and of concluding peace between the two nations. He returned with his bride and a rich dowry; but, unfortunately, a storm arose in the Straits of Dover, and the ships containing his money were lost, the King being so impoverished that he was glad to accept money from the Master and Brethren of the Maison Dieu to meet his necessities. The peace which Richard IX achieved was not very long lasting for we soon find recorded that Henry V having carried on a victorious campaign in France in 1415, culminating in Agincourt, sailed from Calais to Dover, where he was hailed as a “conquering hero“ and carried shoulder high to land. The King returned to a conference at Calais the next year, and finding that owing to the incompleteness of his victories his claims were not recognised, he returned and collected at Dover 1,500 ships, including the vessels of the Cinque Ports, and an army of 25,500 men, the largest force that had ever left this port. The succession of victories won by that army made Henry V, for the time, master of the situation, and he returned to Dover in 1421 with the daughter of the King of France as his bride, and a treaty which made him Regent, with the right of succession, to the throne of France. 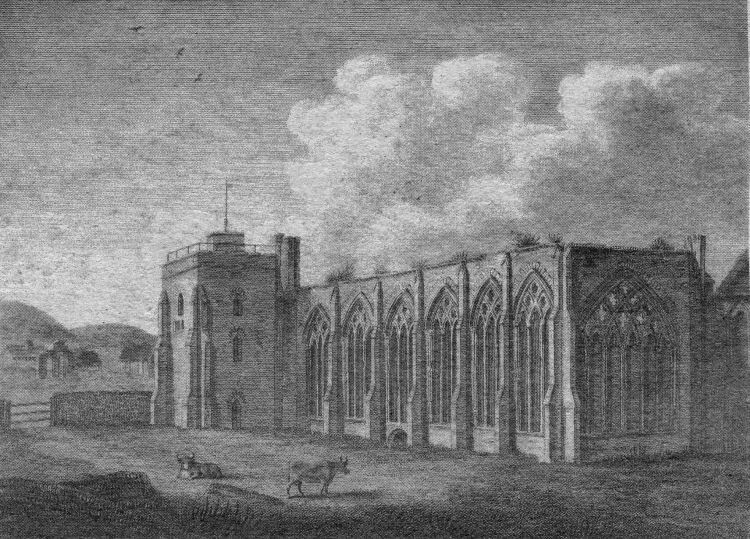 According to the custom of those times, when Henry V had embarked with his large army at Dover, the Maison Dieu had been used by the great officers of State; but his return journey was quieter — although the ostensible object of his visit to London was the coronation of his Queen, the real pressing necessity was money, to maintain the army of occupation, which he had left in France. In the King’s absence, that army met with disasters, which, in June, 1421, caused the King to hurry back, bringing with him 24,000 archers and 4,000 choice men-at-arms. The embarkation at Dover occupied two long days, in June, and, on their arrival in France, there was a series of brilliant victories. The King and Queen of England kept their Court in the Palace of the Louvre; but, at the pinnacle of his might, a fatal malady struck down the victorious King, and a funeral car, bearing his mortal remains, proceeded slowly from Paris, through the provinces, to Calais, and crossed the Channel. Received at Dover by hundreds of knights and esquires, with black plumes and lances reversed, the sad procession passed the Maison Dieu, moving in slow solemnity till it reached St Paul’s, London, and from thence to the tomb at Westminster Abbey, where, in triunity of character, the great Prince of Wales, the illustrious Lord Warden, and the brilliant warrior King, rests. The effigy of Henry VI is placed in the western window of the Maison Dieu, presumably because the boy king stayed there, either on his going to, or returning from his coronation at Paris, as King of France, in November, 1431. Also, the effigy of Richard III is in the western window of the Maison Dieu. Whether he ever visited it, is uncertain. During his brief reign, the men in authority at Dover were in his favour, both at the Castle and the Maison Dieu; but the Cinque Ports forces stood aloof, and from their Brodhull went forth the order, “No precept from Dover Castle to be obeyed.“ Richard, however, showed his favour for Dover by imposing on persons, horses, sheep, cattle, and merchandise carried between Dover and Calais, a tax to build the sea wall at Dover; but, after his short reign of two years, the Tudor period set in, when Henry VII largely transferred the cross-Channel traffic to Sandwich, and thus commenced the decline of the Maison Dieu. In the year 1524, the Master and Brethren signed the Act of Henry VIII’s supremacy, and, ten years later, the same King’s Commissioners suppressed the establishment. When, in 1534, the Hospital was suppressed, the King kept the buildings in hand to be used for National purposes, In the reign of Queen Mary, the Maison Dieu was converted into a Victualling Office for the Navy, the well-fitted brewhouse and bakehouse left there by the Master and Brethren answering for Naval purposes; and, during the critical period of the reign of Elizabeth, it was of great use in victualling the ships which were fitted out to meet the Spanish Armada. About the close of that reign, the red brick mansion on the southern side of the Maison Dieu Hall was built, as the residence of the Agent Victualler; and there were stores in connection with this Victualling Office, at the Victualling Yard, beside the quay in Strond Street, from whence despatch boats communicated with the fleet in the Downs. During war periods, this agency was very busy; but, during the conflict between Charles I and his Parliament, the victualling business was suspended, and the tower of the Maison Dieu was fortified for the defence of the town. At a later date, some portions of the premises were used for private purposes; but the Maison Dieu never ceased to be a Victualling Office until the year 1831, when it was handed over to the Ordnance Department, and the commanding Royal Engineer occupied the adjoining residence. They kept it in hand until the 20th May, 1834, when the property was offered for sale at the London Auction Mart, and Mr W. F. Greville, of the Marine Parade, Dover, claimed to be the purchaser; but the Ordnance Board refused to convey it to him. About eight months later, the part on which the Maison Dieu stands was purchased by the Town Council. A PASTORAL scene off Dover’s main street 180 years ago as cows grazed in a meadow surrounding the ancient Maison Dieu. This print, of 1801, depicts the building when it was in a somewhat ruinous state. The great hall had no roof, weeds and saplings were growing on top of the walls and the lofty windows were bricked-in. Beyond the Maison Dieu is a corner of the old Priory, now Dover College, which was also in ruins. As soon as the Town Council secured possession, they transformed the part next to Ladywell into a prison, in place of the small one which stood on the site of the present Market and Museum. In February, 1839, the Town Council resolved that it was desirable to restore the Maison Dieu Hall, though no practical steps were taken to effect that object; but, previously, the old Chapel had been transformed into a Sessions House, first used for the Quarter Sessions on 16th February, 1836, and was also used as the meeting place of the Town Council. On the 17th October, 1851, a Common Hall was held in the new Sessions House, to advocate the restoration of the Maison Dieu Hall, when it was resolved to carry out the restoration according to the designs of Mr Ambrose Poynter, architect. 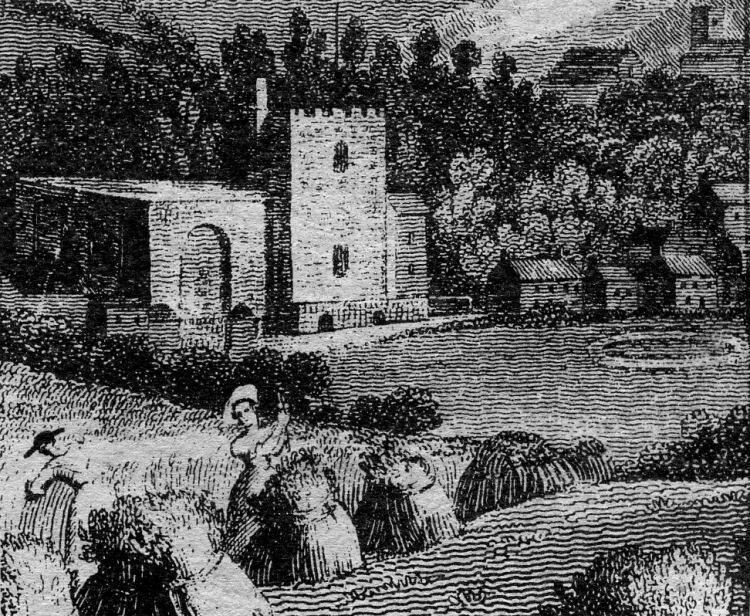 Another view of the Maison Dieu from across the Priory Farm fields from a print of 1820.